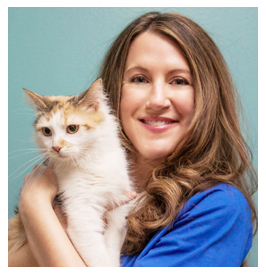 Dr. Julie Kelly completed her undergraduate degree at University of Illinois, her Doctorate of Veterinary Medicine at Michigan State University, and post-graduate high quality high volume spay/neuter (HQHV) training at Humane Alliance. Dr. Julie lived in Chicago for almost 20 years before moving to Michigan. In her previous life, she earned an MS in Human Clinical Nutrition from Rush University and a Certificate in Clinical Trials Management & Regulatory Compliance from the University of Chicago. Dr. Julie recently completed the University of Florida Graduate Certificate in Shelter Medicine. Outside of work, Dr. Julie enjoys spending time with her husband, their beloved APBT Ike, and their five crazy cats: Zelda, Moose, Squirrel, Fritz and Miller. She also enjoys eating out, watching movies, listening to music, riding her bike and ordering things from Amazon so that her cats can have more boxes.